The Corporate Curmudgeon: "I Walked Away From An Easy 2K"
"I Walked Away From An Easy 2K"
Picture this: You’ve completed your first week of training for your new job when the HR-ers running things announce that you are now eligible for a $2000 cash bonus. You brace yourself for the daunting list of goals you must reach to qualify, but no -- to get the money you need to do just one thing: quit. Give up the rest of the training, walk away, and you get two large. 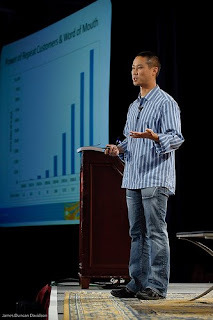 That’s how they do it at Zappos, an online shoe and clothing retailer that will do a billion dollars in business this year. The CEO, Tony Hseith says of the invitation to quit, “We started at $100 and keep upping it. Only 2-3% take the offer and that’s not high enough.” But get this – the offer comes with FOUR MORE WEEKS of training to go. I don’t know if this matches your experience, but facing four more weeks of corporate training, most people are willing to grab the “just shoot me now” buy-out. Hseith explained that “culture and brand are two sides of the same coin,” and so he wanted to be part of a hang-out-with culture. If you go to YouTube, you can see the employees having fun – there’s the “HR Dancing Queen,” shaking it in ways that would make the typical HR person merely tremble. Speaking of trembling, do NOT watch the video called “Slap our CEO” with people from HR – they will explosively vomit at the point where Hseith not only gets slapped, but then slaps an employee, apparently for showing up late for work. The people in the video were being playful, but nothing is fun to watch when there’s vomit on your shoes. All of which might lead you to believe that the CEO would be a Robin Williams sort, bouncing about being wacky. But Hseish resembles a Buddhist monk in blue jeans – he’s not just of Asian descent with stubble-cut hair, but he has a moving stillness that makes you think he’s doing a walking mediation. You’ve probably read “Good to Great,” and so you know that Jim Collins described the leaders of great companies as “self-effacing, quiet, reserved, even shy.” Tony Hseith goes much further: When I commented on how different he was from the typical pump-you-up entrepreneurs I meet, he merely said “I’m an introvert,” and that was that. So an introvert created a company full of extroverts so outgoing that the company’s brand is built on playfulness. What does that say to leaders about “set the example”? It says this: The company isn’t who you are; the company becomes who you hire and fire, and who you promote, and in this case, who you pay to leave training and go away. ©2009 by King Features Syndicate, Inc.